We’re very excited to start registrations for our new 2017 Kids Dance Term, which will start Saturday, 7th January and run until Thursday, 22nd June. We offer classes in Ballet, Contemporary, Hip Hop, Tap & Musical Theatre. Our Early Gift to You this December – Extended! 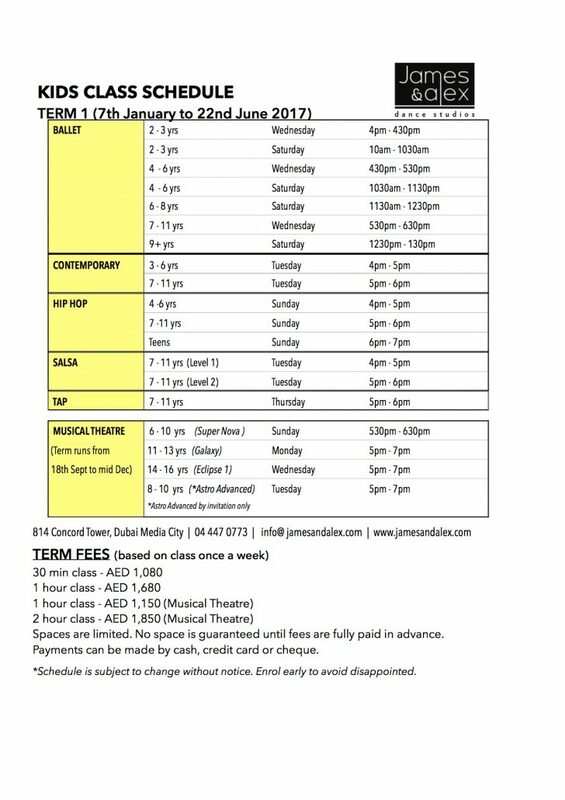 BUY A 12-CLASS PACKAGE FOR AED 720, AND WE’LL GIVE YOU 15 CLASSES! http://jamesandalex.com/wp-content/uploads/2016/12/Extended-Ad.jpg 823 1500 James & Alex Dance Studios http://jamesandalex.com/wp-content/uploads/2014/11/James-Alex-approved-Logo.png James & Alex Dance Studios2016-12-18 10:17:132016-12-18 10:17:13Our Early Gift to You this December - Extended! Struggling with your salsa timing? The ultimate workshop to teach you how to dance on time and with the music! We will teach you the theory and give you exercises to put that theory into practice from a dancers point of view. Our Early Gift to You this December! http://jamesandalex.com/wp-content/uploads/2016/12/12_hour_package.jpg 447 640 James & Alex Dance Studios http://jamesandalex.com/wp-content/uploads/2014/11/James-Alex-approved-Logo.png James & Alex Dance Studios2016-12-03 22:22:212016-12-17 12:54:26Our Early Gift to You this December!